Somali President, Speaker and former Alshabaab deputy leader Mukhtar Robow. 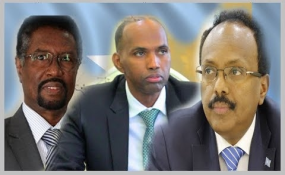 Somalia's National Assembly Speaker Mohamed Mursal Abdirahman has failed to reach an understanding with President Mohamed Abdullahi Farmaajo and Prime Minister Hassan Ali Khaire over the latter's stance in the South West elections. Radio Dalsan has learnt that the Speaker held separate meetings with the President and Prime Minister on Monday night to discuss the issues. The Speaker is said to have tabled three issues of concern to the President and Prime Minister. He has demanded that the Federal government play a neutral role in the upcoming Southwest State elections. He pointed out that the government had publicly shown to favour two candidates in the race at the expense of regional presidential hopeful and former Alshabaab deputy leader Mukhtar Robow. Federal government had earlier protested Robow's candidature. Abdirahman has asked the government not to send back the 100 federal police officers sent last week to Baidoa to maintain law and order in the polls. There have been concern that Alshabaab may try to disrupt the polls. The Speaker has also called for the reinstallment of the "disbanded" House Finance and Budget committee. His Deputy Mahad Salad had disbanded the committe over a controversial report on alleged fraud of upto $40M at the Ministry of Finance and the Banaadir Regional Administration. He has declared his Deputy's decision as null and void. The report threatened to divide the House with analyst pointing fingers at possible machinations by the Prime Minister's Office and the Villa Somalia. This is the first time Speaker Abdirahman finds himself in a collission course with the President and Prime Minister since he took office in April 2018. He had replaced Mohamed Osman Jawari who was accused of aligning himself with opposition lawmakers who were allegedly planning a no-confidence motion against the government of Prime Minister Hassan Ali Khaire. However MPs who support the prime minister brought a no-confidence motion against Jawari, which eventually forced him to step down after nearly a month of politica.